Princeton University Press, 9780691004006, 176pp. We are all familiar with the image of the immensely clever judge who discerns the best rule of common law for the case at hand. According to U.S. Supreme Court Justice Antonin Scalia, a judge like this can maneuver through earlier cases to achieve the desired aim--"distinguishing one prior case on his left, straight-arming another one on his right, high-stepping away from another precedent about to tackle him from the rear, until (bravo ) he reaches the goal--good law." But is this common-law mindset, which is appropriate in its place, suitable also in statutory and constitutional interpretation? In a witty and trenchant essay, Justice Scalia answers this question with a resounding negative. In exploring the neglected art of statutory interpretation, Scalia urges that judges resist the temptation to use legislative intention and legislative history. In his view, it is incompatible with democratic government to allow the meaning of a statute to be determined by what the judges think the lawgivers meant rather than by what the legislature actually promulgated. Eschewing the judicial lawmaking that is the essence of common law, judges should interpret statutes and regulations by focusing on the text itself. Scalia then extends this principle to constitutional law. He proposes that we abandon the notion of an everchanging Constitution and pay attention to the Constitution's original meaning. Although not subscribing to the "strict constructionism" that would prevent applying the Constitution to modern circumstances, Scalia emphatically rejects the idea that judges can properly "smuggle" in new rights or deny old rights by using the Due Process Clause, for instance. In fact, such judicial discretion might lead to the destruction of the Bill of Rights if a majority of the judges ever wished to reach that most undesirable of goals. 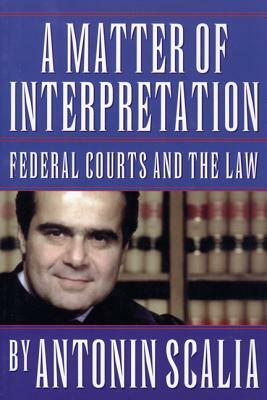 This essay is followed by four commentaries by Professors Gordon Wood, Laurence Tribe, Mary Ann Glendon, and Ronald Dworkin, who engage Justice Scalia's ideas about judicial interpretation from varying standpoints. In the spirit of debate, Justice Scalia responds to these critics. Antonin Scalia (1936-2016) was an associate justice of the U.S. Supreme Court for three decades.